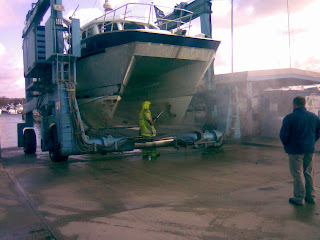 Silver Spray is lifted out of the water once every six months for cleaning, anti-fouling and inspection. This is usually done within 24 hours and we are back fishing. 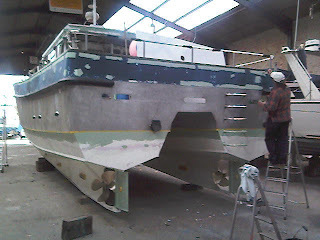 After 3 and a half years of hard work Silver Spray was due a complete repaint. 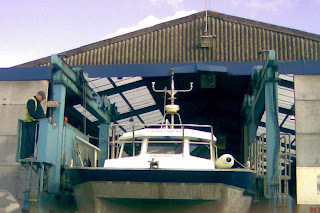 We had chosen to put her in the shed at Cobbs Quay Poole to be out of the January weather (good call). 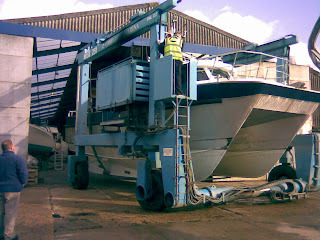 During the 7 day refit we did a complete repaint from the cabin roof to the antifouling, had the generator out for urgent repairs and had a new water intake welded on for an upgraded livebait system. S**t thats looking close now.